Like many people, believers and non believers alike, I used to assume that while he may not have done all the things he was said to have done, there must have been a real, historical person named Jesus. 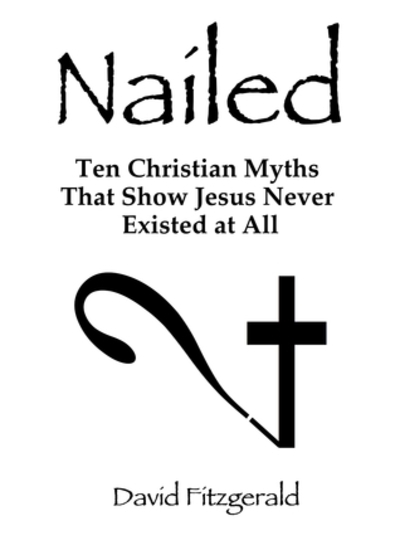 In Nailed David Fitzgerald questions this assumption, taking a look at ten myths about Jesus. The title overstates the case a bit, since it's probably not possible to prove with absolute certainty that Jesus did not exist, but the author calls on the reader to question some assumptions they may have had about the figure of Jesus. He talks about the lack of records we have of any of the miraculous events of Jesus' life when compared with the records of other events of historical significance, such as, for example, Ceasar's crossing of the Rubicon. He also points out the lack of consistency between the gospels' portrayal of Jesus, and the fact that the gospels were not written by eyewitnesses. I was a little surprised that people might think that they were since I thought it was common knowledge that the gospels were written decades after Jesus' death, but I suppose if you only read the Bible out of context and nobody told you about it you wouldn't know from the text. The book is fairly short, and does not go into huge detail, but it would be a good jumping off point for further research. It is written in clear, plain English, making it accessible to the casual reader who may not yet know much about the topic. Nailed is an interesting, thought provoking book which may cause you to doubt what you thought you knew about Christianity. What are the best books to give as Christmas presents? What are you reading in September 2016? Who is the most courageous woman in history?